Blueberries are worth getting soaked to the skin. My friend Pat invited me to pick blueberries with her at The Berry Patch in Cleveland, Missouri., early on the morning of the Fourth of July. It was fun, despite the rain. My friend Pat invited me to pick blueberries with her on July 4th at The Berry Patch, in Cleveland, Missouri, which is about 20 minutes from where we live. 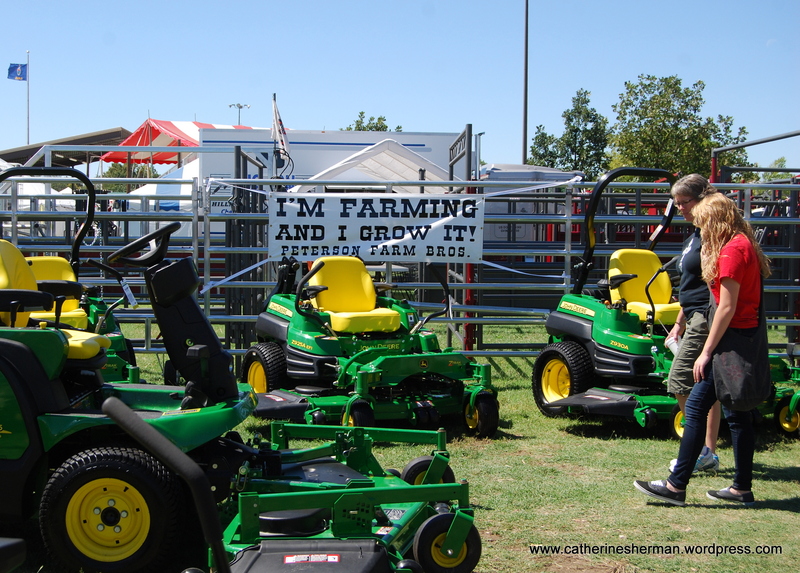 I’d heard about the farm years ago, but had never visited so I was glad for the invitation. The forecast called for rain, but we decided to go anyway. Rain started as we drove, but optimistically we continued, thinking that at least we’d have the place to ourselves. Wrong. There were about fifty cars parked there when we arrived at 7:25 a.m. The farm opens at 7 a.m. For some, picking blueberries on Independence Day is a tradition. Since blueberries are only available for a few months — several types of blueberries are planted to stretch out the season — July 4th is a good reminder to get to the farm. You can rush home with your blueberries to add them to a red white and blue dessert. Pat said that because of the rain, the crowd was actually quite thin. When it’s sunny, you have a lot more competition for blueberries. There are many bushes, however. The Berry Patch is the largest berry farm in Missouri. There are 30 acres of blueberry bushes and four acres of blackberry bushes. A store sells jams, syrups and baked goods, and there is a playground area for kids, and picnic tables for picnic lunches. Thunder crashed when we got out of the car, but fortunately we didn’t hear much thunder or see lightning afterward. It did rain a lot, though. After a while, you forget the rain as you pick pick pick those blueberries. The Berry Patch provides white buckets with a plastic bag liner. 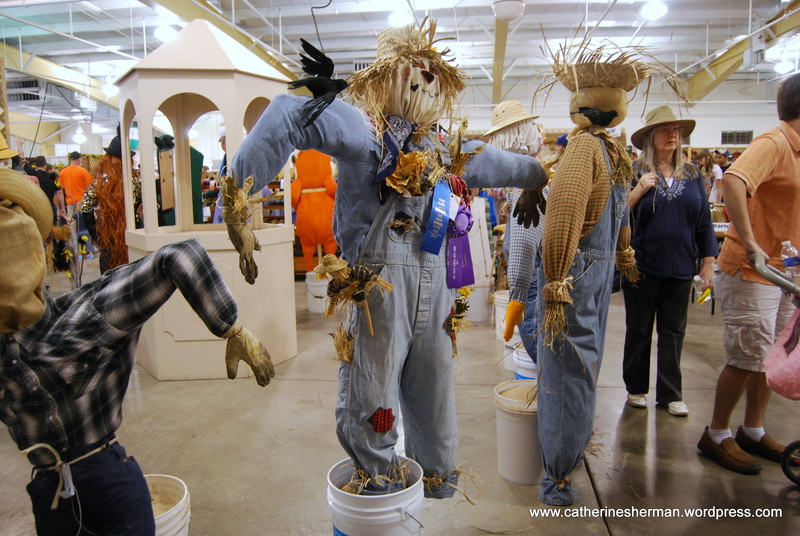 They provide twine so that you can attach the bucket to your waist so you have two free hands to pick. After about two hours of picking, I picked almost six pounds and Pat almost nine pounds. She had two buckets. I bought some blueberry jam and blueberry syrup, too. As we climbed into the car, we were soaked to the skin, but I was so glad we ignored the weather report. I hope to make blueberry picking a July 4th tradition. I may even go again this summer to replenish my supply. I’ve already eaten two cups of blueberries today. Thank you, Pat, for a fun morning. I saw these limestone fence posts, called post rocks, on a recent drive to western Kansas. 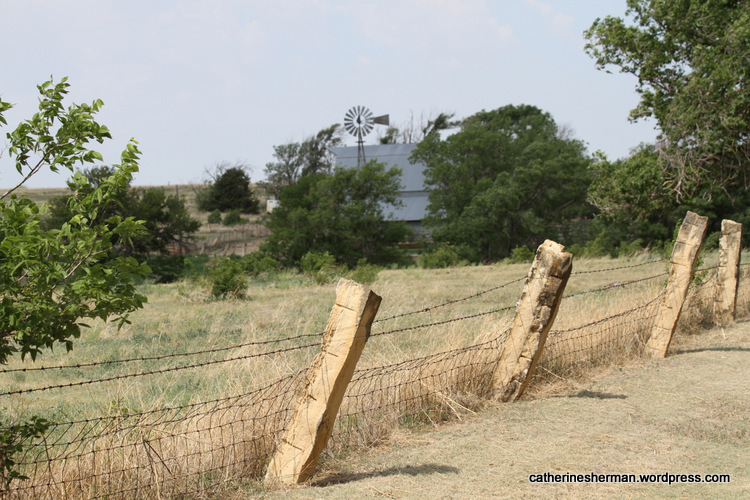 I’ve lived in Kansas most of my life, but I hadn’t seen more than a few limestone fence posts until this past weekend when I saw miles of them as I drove west in a section of the state I’d never visited before. It has been estimated that at the peak of their use, there were about 40,000 miles of these stone post fences in central Kansas. In the last quarter of the 19th century, ranchers and farmers needed fences to keep the cattle from wandering onto cropland, but wood was scarce. Providentially, there is a bed of limestone buried only a few inches beneath the top soil, which is about about 18 inches in thickness, the perfect dimension for fence posts. It was easy to shape the soft stone, which hardened, enabling the posts to resist weathering in the elements. About Post Rocks in Kansas. More about Post Rock Fences and Where to Find Them. 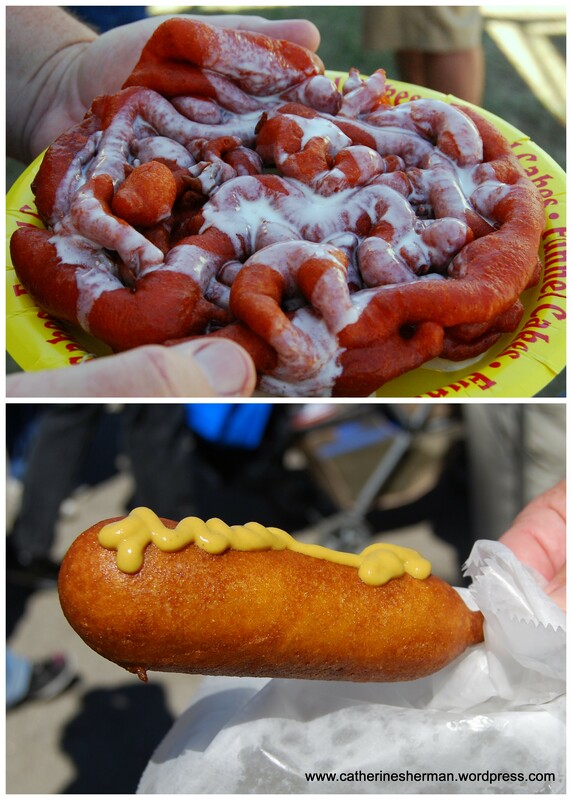 Here’s fair fare — a carrot cake funnel cake on the top and a corn dog on the bottom — at the Kansas State Fair, September 2012. 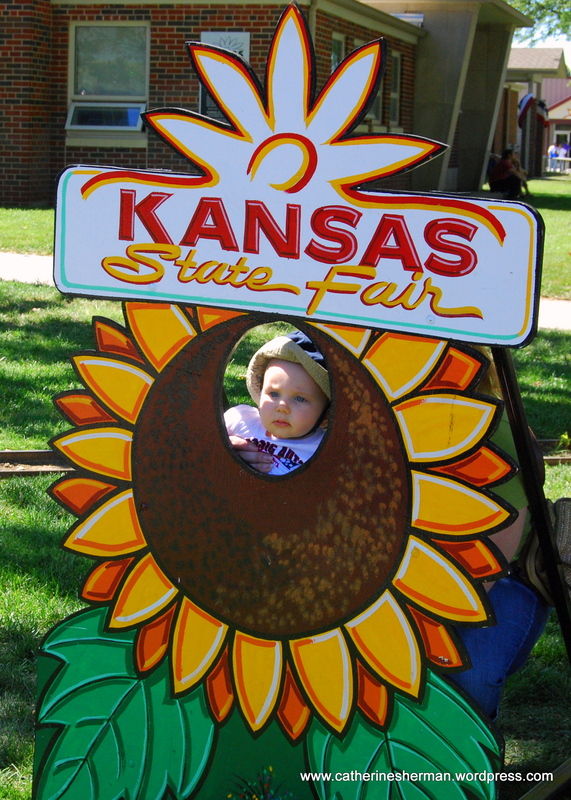 More than 350,000 people from all 105 Kansas counties and several other states visit the fair each year, which begins the Friday following Labor Day and lasts for 10 days at the Kansas State Fairgrounds in Hutchinson. Many thousands of those visitors seemed to be there the day we visited, the first Saturday. It was busy! 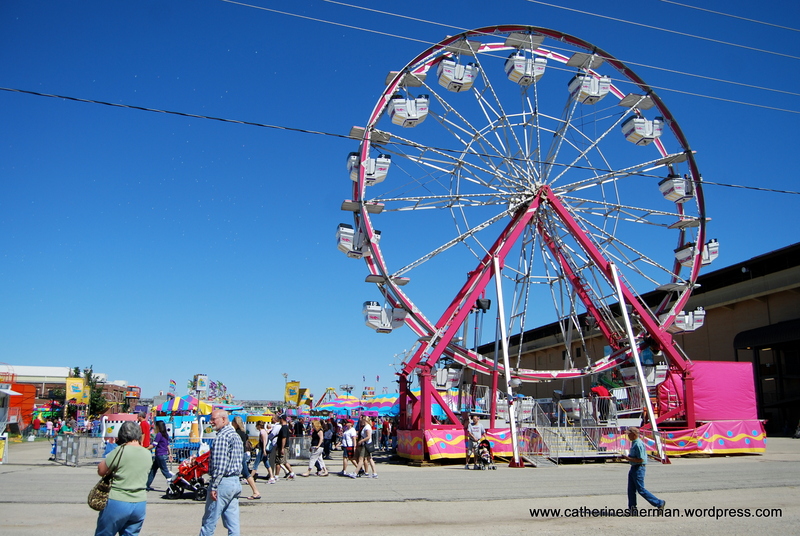 There are more than a thousand commercial vendors, including those wonderful funnel cake and corn dog stands. There are about 30,000 entries in various competitions. There are lots of musical acts from local to national, including “Boston” and “Heart.” I didn’t see any concerts, unfortunately, but I did try some carrot cake funnel cake. Delicious! I’ll let my photographs do the talking. The Kansas State Fair website. 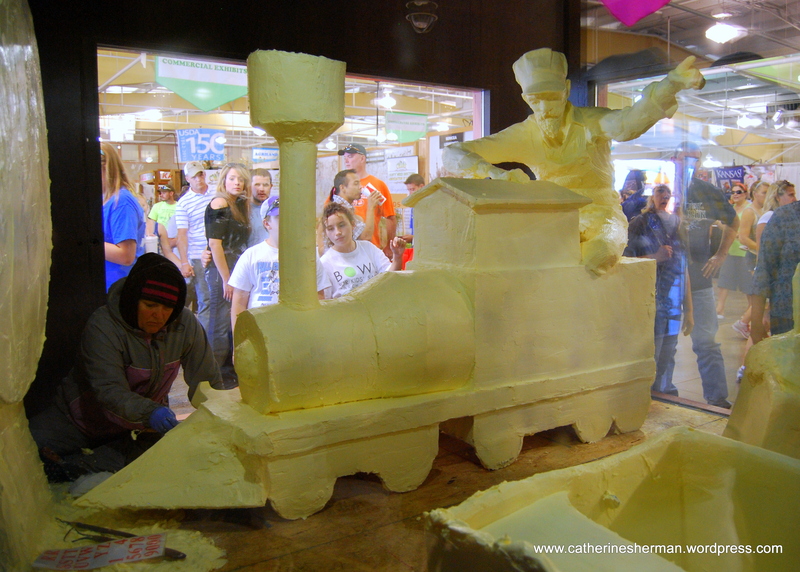 Sculptor Sharon BuMann is creating a train and cars from 450 pounds of butter. The cars carry the Kansas icons of Dorothy wearing her red shoes and her dog Toto. Check out the movie “Butter,” starring Jennifer Garner, Hugh Jackman, Alicia Silverstone and Olivia Wilde. Two women battle in their town’s annual butter carving competition. "Butter" movie. 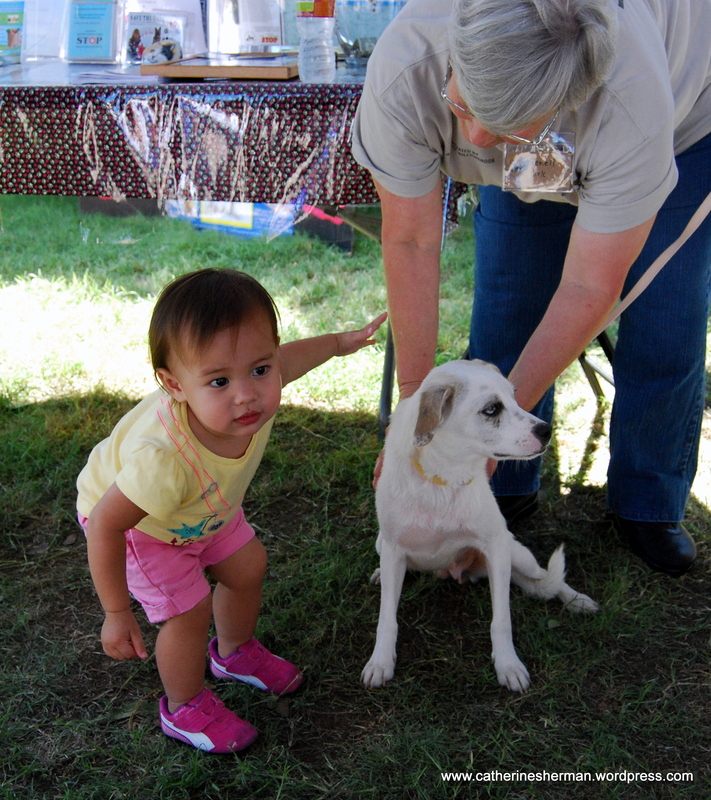 A little girl meets a dog available for adoption at the Hutchinson Animal Shelter booth at the Kansas State Fair, September 2012. 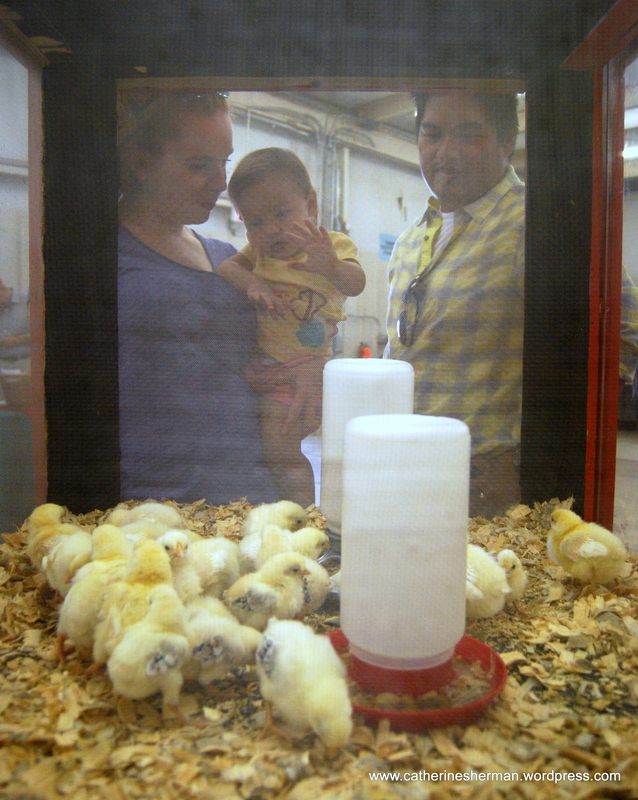 A family watches chicks at the Kansas State Fair, 2012. 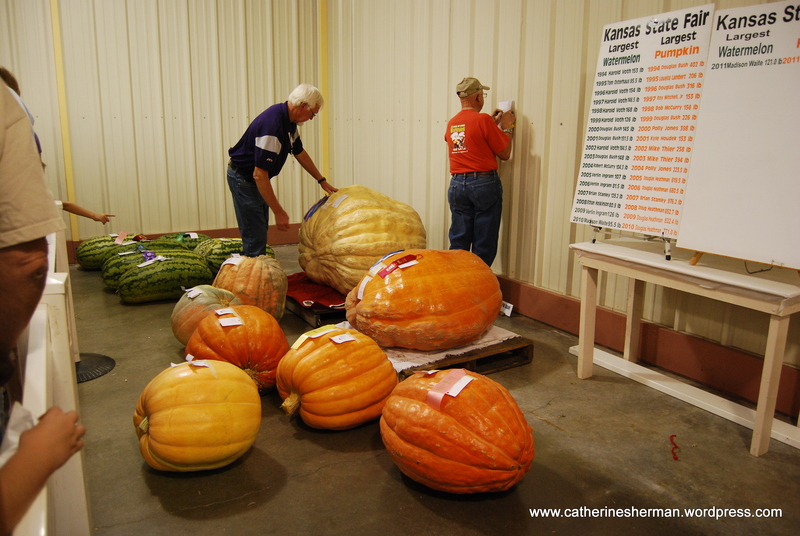 Judges examine pumpkins at the Kansas state Fair, September 2012. 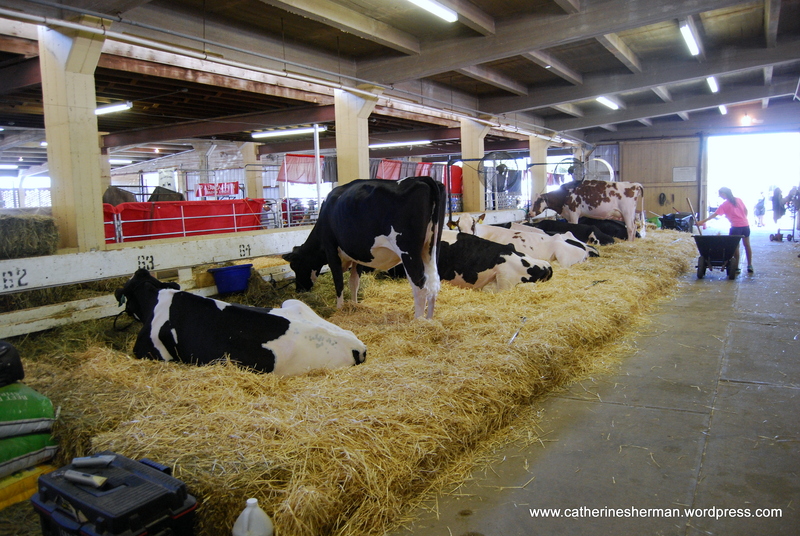 Holstein Cows, Kansas State Fair, September 2012. 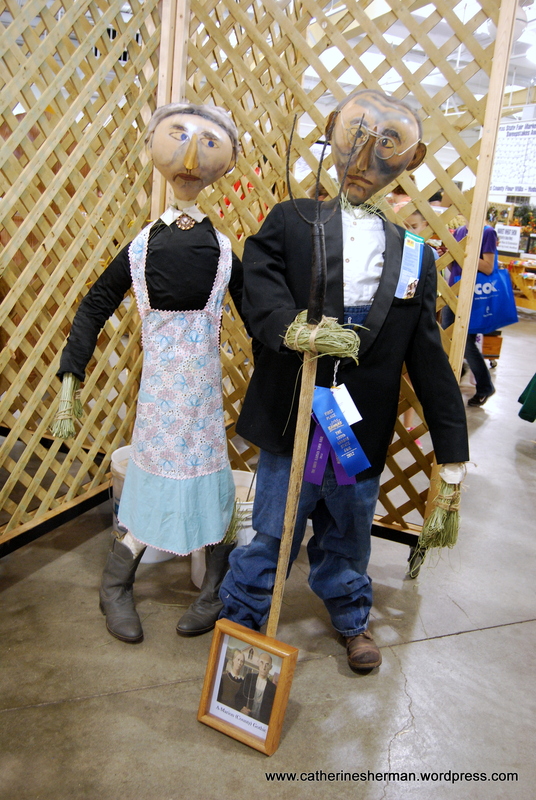 Scarecrows, Kansas State Fair, September 2012. 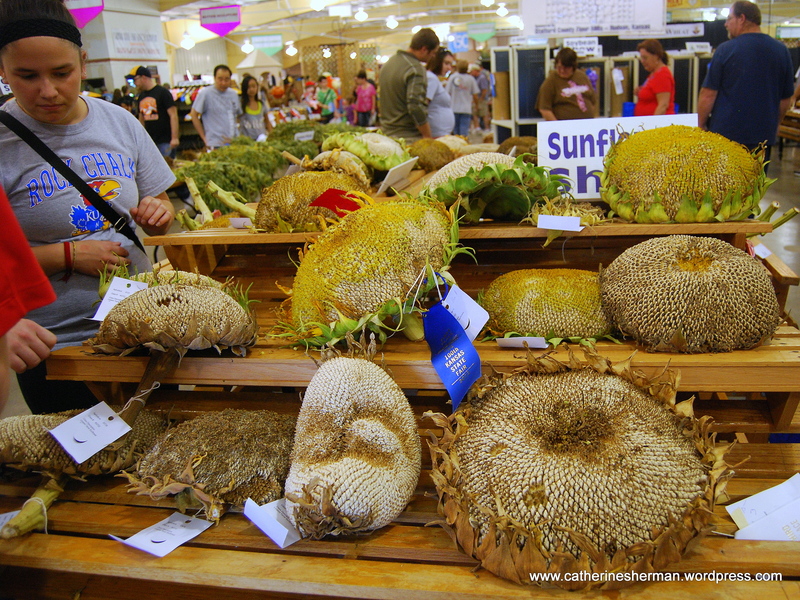 The sunflower is the Kansas State Flower, so it’s only fitting that sunflower seed heads have a special category at the Kansas state Fair. 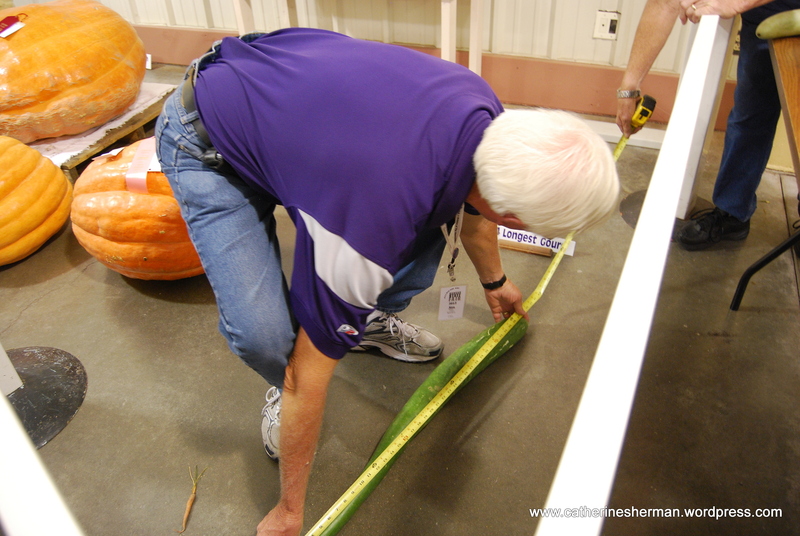 Judges measure the longest gourd at the Kansas State Fair, September 2012. 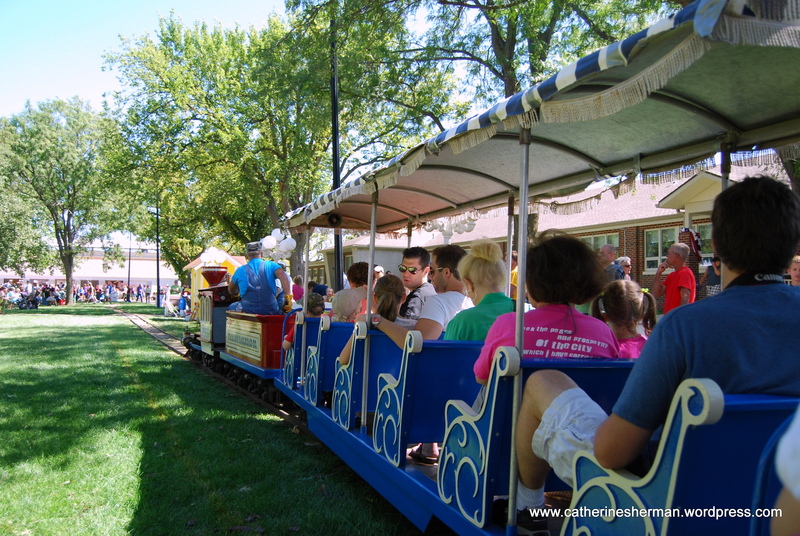 No visit to the Kansas State Fair is complete without a trip on the train. 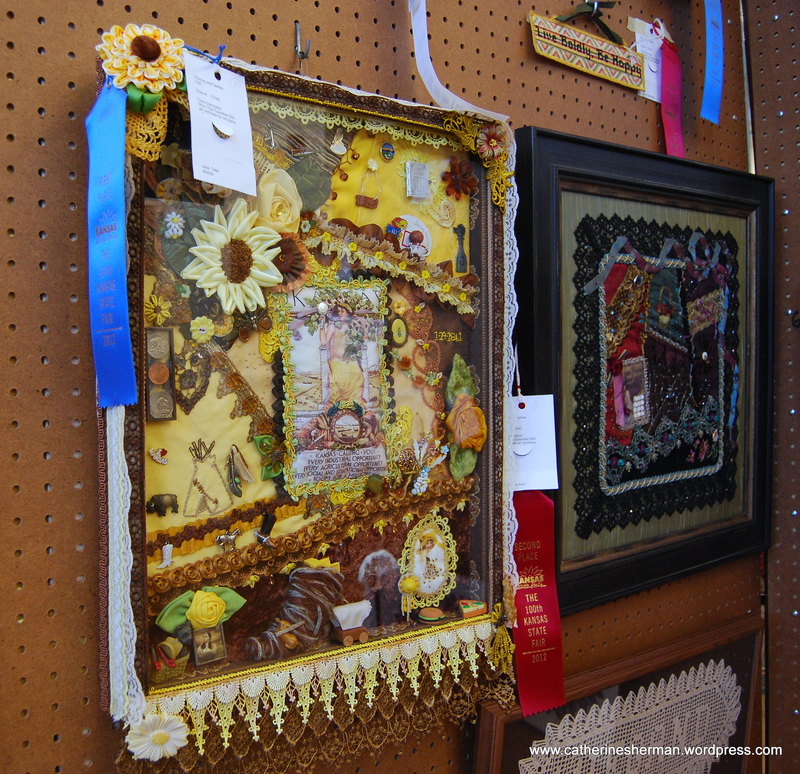 Prize-winning needlework, Kansas State Fair, September 2012. 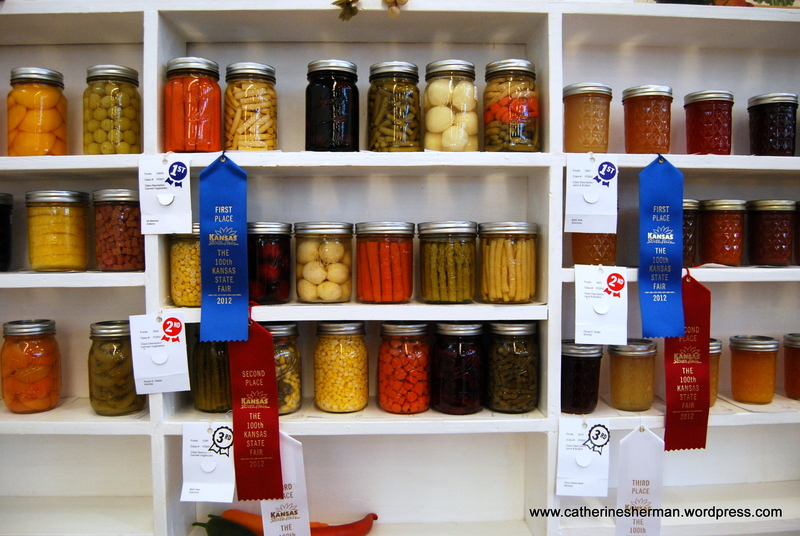 Fruits and Vegetables, Kansas State Fair, September 2012. 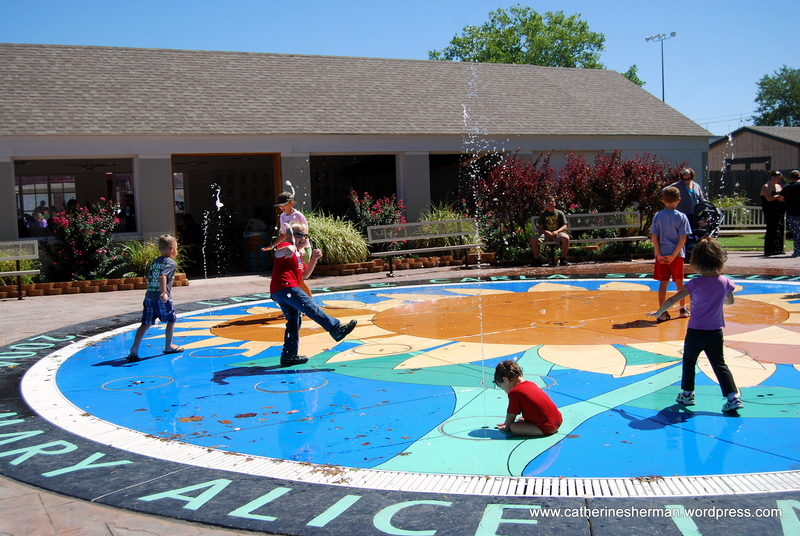 Children play on the giant sunflower fountain at the Kansas State Fair, September 2012. 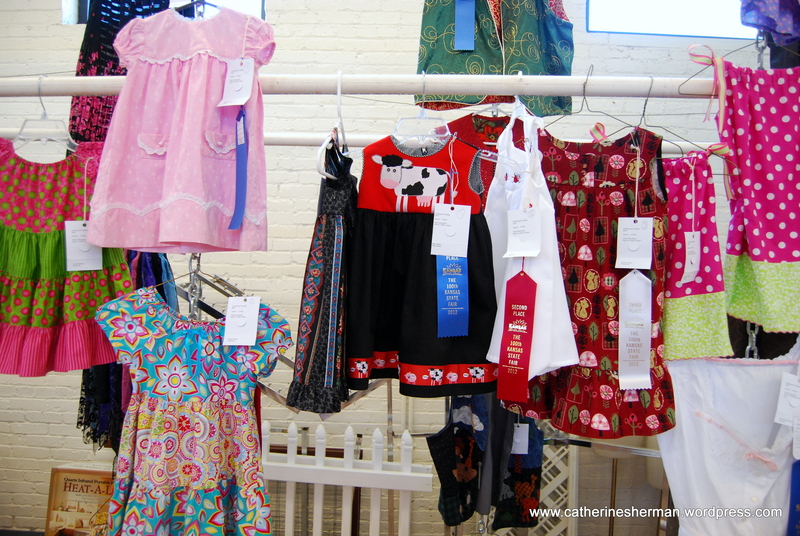 Clothing Display, Kansas State Fair, September 2012. What is this bird? 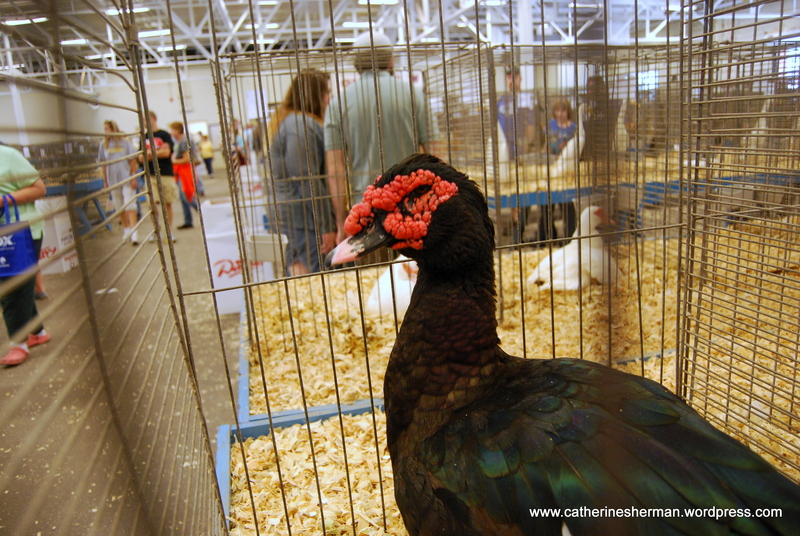 It’s in the 4-H Poultry Exhibition at the Kansas State Fair, September 2012. 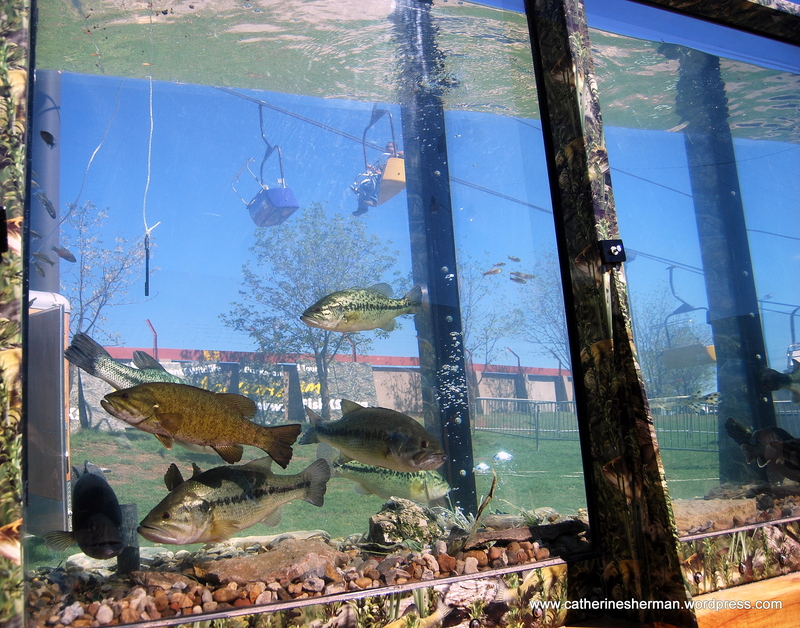 Kansas fish are displayed in the Kansas Department of Wildlife, Parks and Tourism aquarium at the Kansas State Fair, September 2012. You can see the Sky Ride gondolas passing overhead. 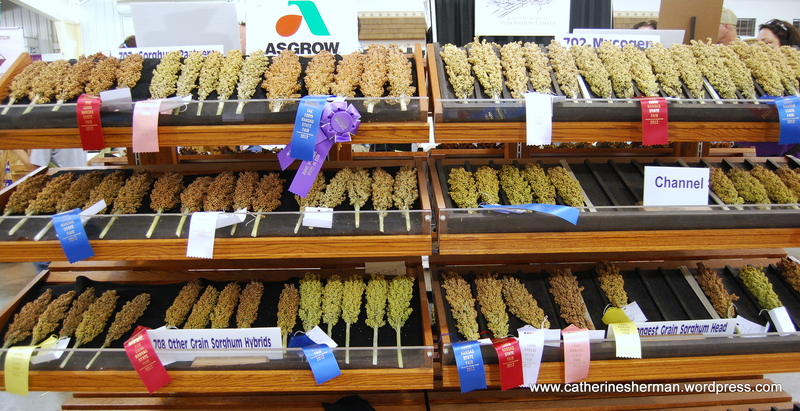 Sorghum, Kansas State Fair, September 2012. Mini Donkey Show, Kansas State Fair, September 2012. 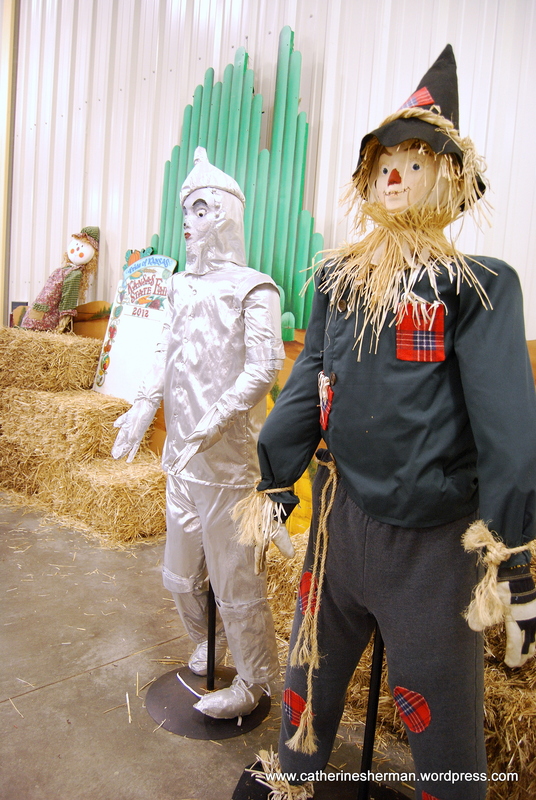 The Tin Man and Scarecrow from the Wizard of Oz greet visitors to the Kansas State Fair, September 2012. 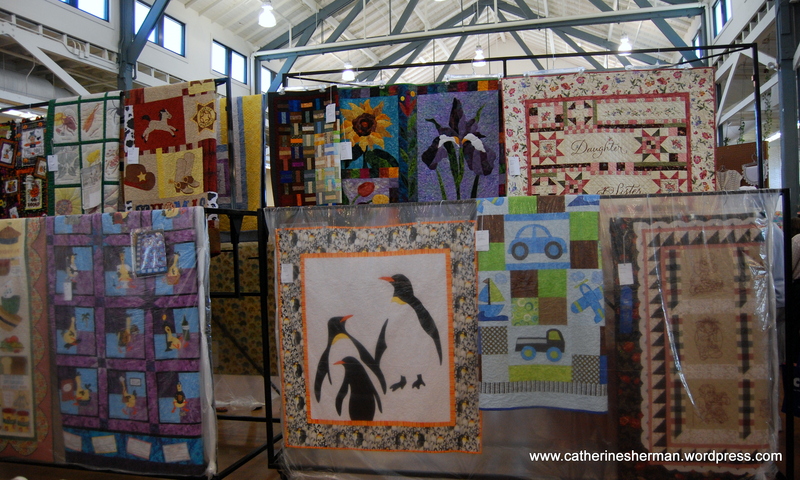 Quilts, Kansas State Fair, September 2012. That engine is hot! 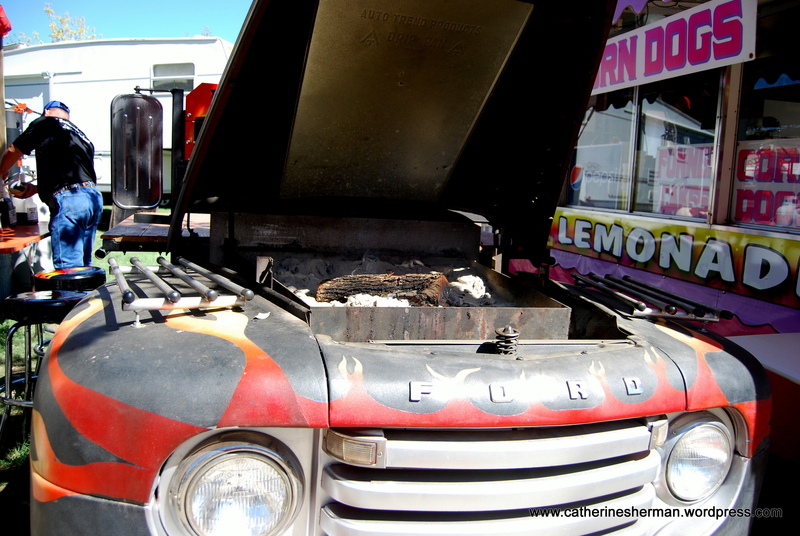 A Ford pick-up truck is now a barbecue pit, Kansas State Fair, September 2012. Ferris Wheel, Kansas State Fair, September 2012. 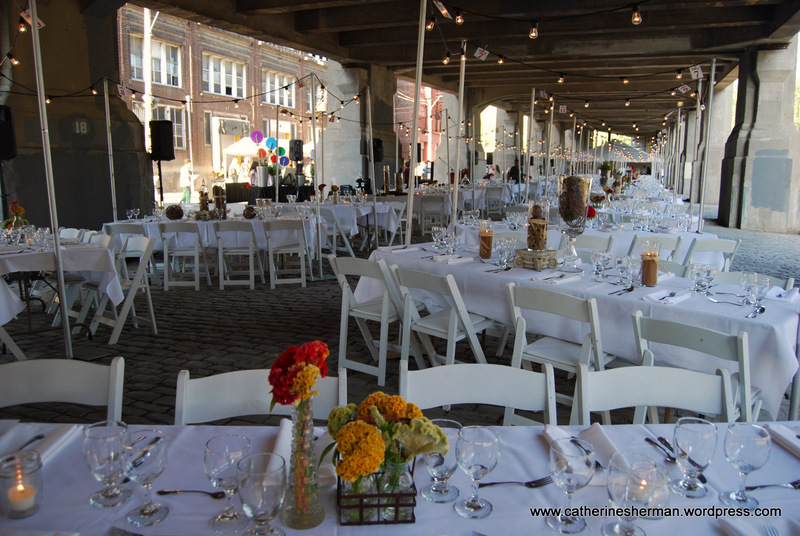 Tables are beautifully set under the historic 12th Street Bridge for the Food Now Fund-raiser in Kansas City, Missouri, on August 27, 2011. 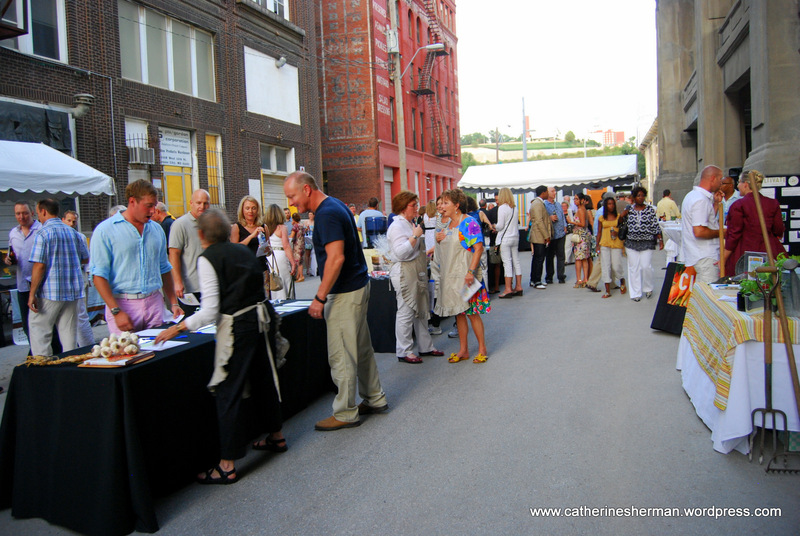 My multi-talented friend Chris B. invited me and several others to the second annual foodNow local food experience under the 12th Street Bridge in the West Bottoms of Kansas City, Missouri, on August 27, 2011. 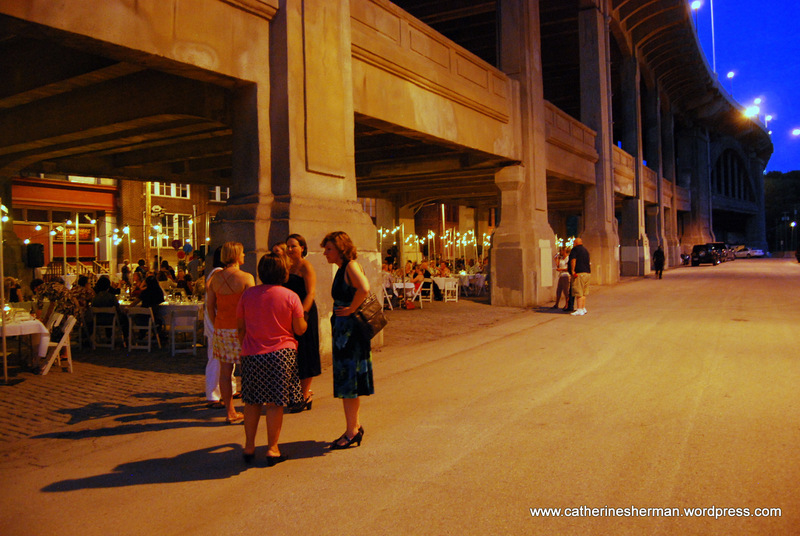 I had no idea what foodNow was, but who wouldn’t want to eat an elegant dinner under an old bridge in one of Kansas City’s most historic areas? Chefs from many Kansas City restaurants prepared a three-course dinner from produce from the area. 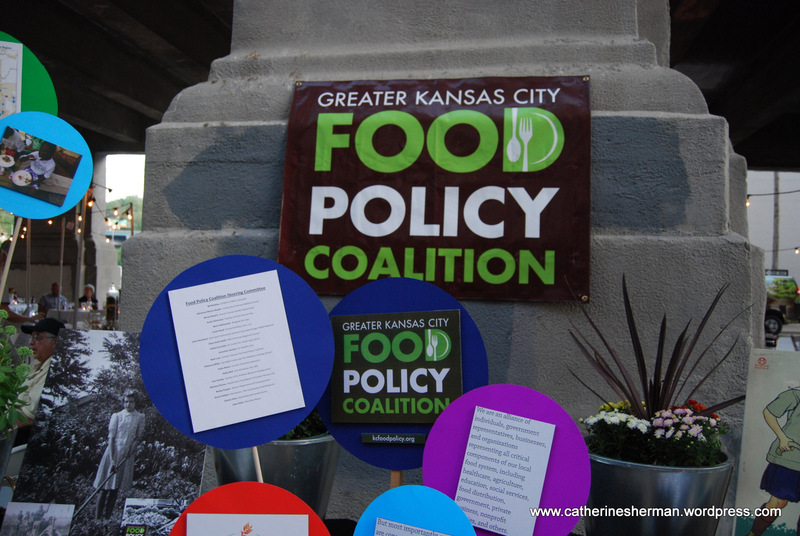 The event was a fund-raiser for Beans and Greens – Nourishing Neighborhoods with Local Produce , Greater Kansas City Food Policy Coalition and Get Growing KC. "Haunted Houses" attract thrill-seekers in the fall near the 12th Street Bridge. The tables were set on the original cobblestone street where farmers brought their produce for sale. I’m glad I was wearing flat shoes. Some women wearing more fashionable footwear were a little wobbly on the cobblestones. Nearby the bridge are old warehouses, which now have a new life hosting “haunted houses” that attract thrill-seekers every fall. Also in the area is Kemper Arena and the site of the American Royal. Each table had a different menu. Chef Michael Turner of the Classic Cup prepared the delicious dinner for my table. There was a silent and a live auction. Unfortunately, my table was far from the auctioneer. An old bridge may be charming, but the acoustics were not that great. I could hear my table-mates, though, and that made for a very fascinating evening. The 12th Street Bridge was built in 1915 and is now undergoing a major rehabilitation. The West Bottoms (official name Central Industrial District) is an industrial area immediately to the west of downtown Kansas City, Missouri at the confluence of the Missouri River and the Kansas River. 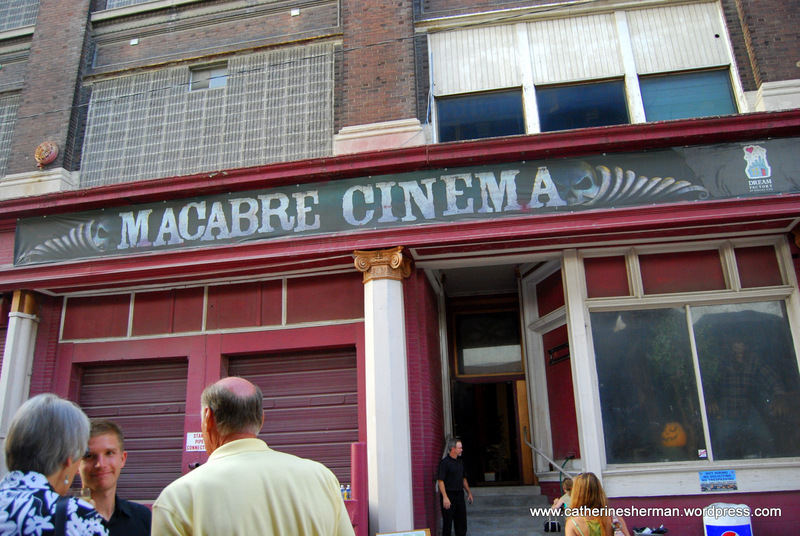 The area is one of the oldest areas of the city and is home to Kansas City’s early agricultural markets. Originally called the “French Bottoms,” French trappers and Kansas Indians traded here centuries ago. French Bottoms sounds a lot more appealing, doesn’t it? Steamships traveling upstream on the Missouri river offloaded their goods at the Bottoms to provision those immigrating west and for trade with Mexico over the Santa Fe Trail. The advent of the railroad increased the importance of the area. Major floods have engulfed the area (1903, 1951 and 1993), which have diminished the area’s commercial and residential importance. You could say river affluence has lessened the area’s influence. Les Dames d'Escoffier International (Heart of America Chapter) sponsored the silent and live auction of cooking and food-related items. Tiny lights illuminate the tables under the 12th Street Bridge in the West Bottoms of Kansas City for the foodNow dinner. About the West Bottoms. Official West Bottoms Site. These honey bees are foraging for nectar on wildflowers in a park. Bees are finding fewer flowers for food as more areas are developed and mowed. These wildflowers were mowed a few days later, leaving no flowers for the bees. My garden is a hang-out for bees of all kinds — honey bees, native bees, carpenter bees. I love watching them going about their business and am glad to help out keeping them fed. Bees are important pollinators. Pollination is essential for most of our food crops. Room for Debate: Saving Bees: What We Know Now. — Lessons from the battle against colony collapse disorder, which is still decimating hives. Also check out Monarch Watch and Pollinator Partnership in my blogroll. For years I've seen these signs along the highways in Kansas. I convinced my husband to stop as we were speeding by the third one I'd seen, and I ran through the thick plant growth and took this photograph. This sign is along Interstate 70. I was born in Virginia, but I’ve spent most of my life in Kansas. Even though I’ve always lived in cities, I’ve never been far from fields of wheat, soybeans and corn. 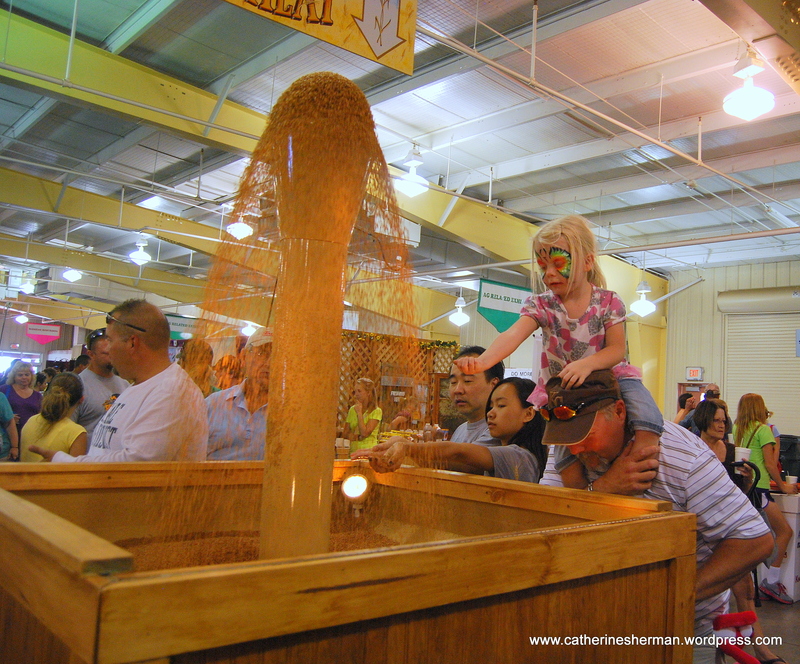 According to the U.S. Department of Agriculture , Kansas is the top wheat producer in the United States. (We’re number one! We’re number one!) This year, Kansas farmers harvested an estimated 360.8 million bushels, up from 356 million bushels last year. Kansas farmers harvested 8.8. million acres this season, about 100,000 fewer acres than a year ago but achieving an average of one more bushel an acre in yield this year. Hurrah for the Kansas farmer and for Mother Nature for glorious weather! Hurrah for farmers everywhere. This wheat field is in the city limits of Overland Park, Kansas, which is the second-most populous city in Kansas, and part of the metropolitan Kansas City area. It's surrounded by commercial development and is for sale, so eventually, you'll see cars here instead of crops. Too bad. I like seeing farm fields. Last year, it was planted in soybeans.